With minimal prerequisites, the book starts from the basics of probability and model fitting and works up to real examples that the reader can implement and modify to build useful vision systems. Primarily meant for advanced undergraduate and graduate students, the detailed methodological presentation will also be useful for practitioners of computer vision. Dr. Simon J. D. Prince is a faculty member in the Department of Computer Science at University College London. He has taught courses on machine vision, image processing, and advanced mathematical methods. 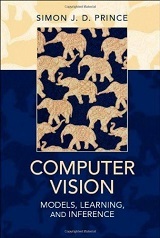 He has a diverse background in biological and computing sciences and has published papers across the fields of computer vision, biometrics, psychology, physiology, medical imaging, computer graphics, and HCI.